Executive Director Peter Power has just returned from a fact-finding mission to famine-risk zones in Somalia. I first met eight-month-old Hassan at the beginning of my week-long trip to northern Somalia, on my first visit to a UNICEF Stabilisation Centre in Hargeisa, Somaliland. The clinic has been set up to deal with Severely Acutely Malnourished children with complications. When I met him, Hassan had been at the Stabilisation Centre for just two days. 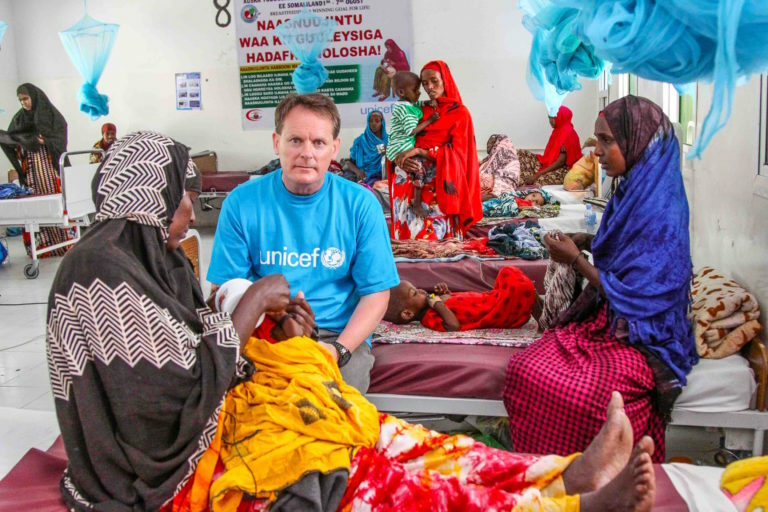 Just before leaving Somalia I returned to the Stabilisation Centre to check on the little boy, sadly, his condition had deteriorated significantly. Hassan is getting the treatment he needs and has a good chance of surviving, but I have been anxiously awaiting an update on his from colleagues in the field all week. 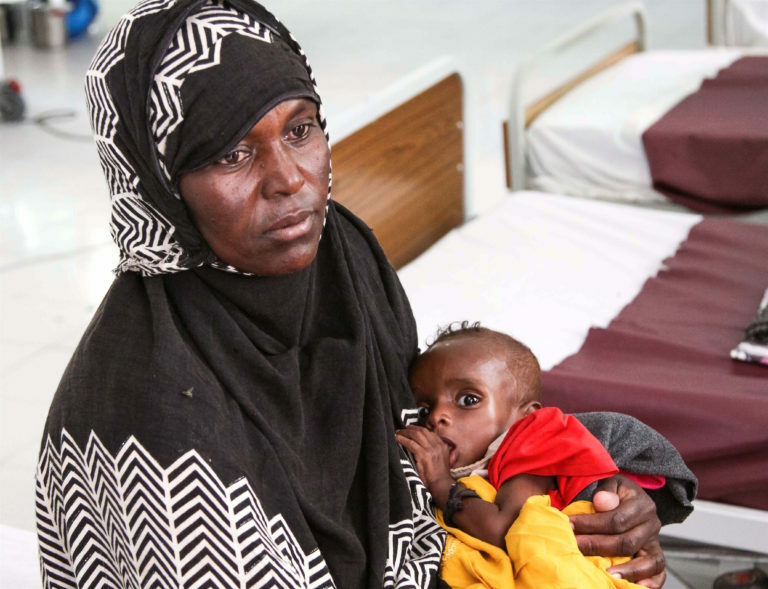 The reality is that he, and many other children just like him, are life-threateningly ill.
Hassan’s story tells us everything we need to know about the developing food crisis in Somalia, and surrounding countries. Hassan and his mother Ugaso (25) come from a village called Ali Aden on the Somalia/Ethiopian border, 60 km from Hargeisa. They made their way to the clinic when Hassan began vomiting about a week previously, but this little boy has actually been sick for months – since he was about six months old in fact. Six months ago the rains failed in northern Somalia and a drought developed, devastating Hassan’s village. Before the drought, the family had two hundred sheep and goats which they herded on the barren landscape. Unfortunately, the drought meant that there was simply not enough food for the animals and most of them died – only 60 animals left. A week ago Hassan began vomitting and Ugaso brought him to a UNICEF Out Patient Clinic (OPC). This is one of 500 OPCs UNICEF has set up in Somalia, in order to deal with the rapidly increasing number of acutely malnourished children throughout the country. The OPC referred Hassan to the Hargeisa Stabilisation Centre, 60 miles from his village. Mum left behind two other children to make the life-saving journey with Hassan. The strength of this woman was made even more apparent when we learned that she lost baby Hassan’s twin brother some months ago. Despite the enormous setbacks she has faced, she managed to seek out and secure the best possible care for her youngest child and she has dedicated herself to his recovery. Ugaso was in her customary position by Hassan’s side when I returned to clinic later in the week. Hassan is just one of 92,000 children who have been treated by UNICEF for Severe Acute Malnutrition since January of this year. It is expected that this number will rise to at least 270,000 children over the coming months. Severe Acute Malnutrition ( SAM ) is the technical term for a child who is so badly malnourished that he or she will require life-saving therapeutic intervention in order to survive. Even if a child survives after treatment in centres like Hargeisa, that child will likely suffer permanent life-long damage because of having suffered from SAM. Frighteningly, 116 children with SAM were admitted to this stabilisation centre alone in the month of May. Even if a child survives after treatment in centres like Hargeisa, that child will likely suffer permanent life-long damage because of having suffered from SAM. Sitting on another bed, rocking her seven-month-old infant son Farhan, sat Ifrah (38). Ifrah told us that Farhan had been sick for four months with diarrhoea and vomiting. He had been admitted to the Stabilisation Centre two days earlier, after he was found to be severely acutely malnourished with complications. Ifrah said: “For two months we didn’t get any food from relatives in Hargeisa, so we live(d) on what we can find. So when Farhan fell ill we were very busy looking for food and water and not thinking about him – four months later (the) situation was getting difficult and a relative told me to bring (him) to hospital in Hargeisa.” Ifrah comes from the same village as Hassan and his Mother, some 60 kilmeters away. Apart from the severely acutely malnourished children, UNICEF experts on the ground have confirmed that 1.4 million children will be acutely malnourished and will still require emergency feeding in one of the 500 Outpatient Clinics that UNICEF has established to deal with the crisis. There is no doubt in my mind that UNICEF’s aggressive scale up and establishment of 500 Outpatient Centres has saved the lives of countless children in Somalia. The dire situation in Somalia is replicated in South Sudan, which the United Nations declared to be officially in famine last February. 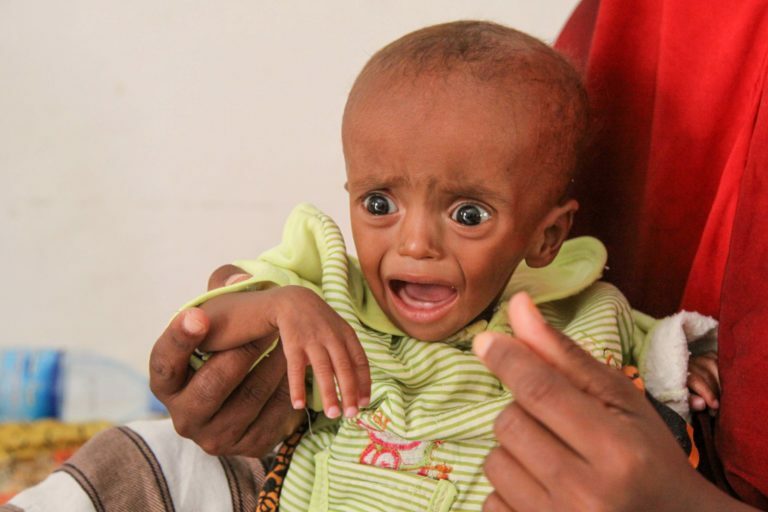 UNICEF is also deeply concerned for children in the Greater Horn of Africa, in Nigeria and in Yemen, who are all caught up in a food crisis of enormous proportions. UNICEF Ireland has issued an emergency appeal for funds. Children need food, water, and medicine & vaccinations that will protect them from deadly diseases like cholera, measles and diarrhoea.